In emails about the 2012 attack on a U.S. diplomatic facility in Benghazi, Libya, department officials discuss sensitive matters in real time, including the movement of Libyan militias and the locations of key Americans. The messages were released last year under the Freedom of Information Act and are posted on the State Department's website. In five emails that date to Condoleezza Rice's tenure as secretary of state during the George W. Bush administration, large chunks are censored on the grounds that they contain classified national security or foreign government information. These emails also are posted on the State Department website's reading room. In a December 2006 email, diplomat John J. Hillmeyer appears to have pasted the text of a confidential cable from Beijing about China's dealings with Iran and other sensitive matters. Large portions of the email were marked classified and censored before release. 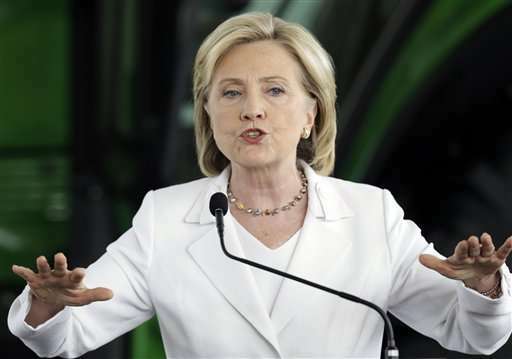 Clinton insists she didn't send or receive classified information. But government officials have found material they deem classified in several dozen of 30,000 emails that the former secretary of state has turned over, an unfolding saga that has dogged her 2016 campaign. What makes Clinton's case different is that she exclusively sent and received emails through a home server in lieu of the State Department's unclassified email system. Neither would have been secure from hackers or foreign intelligence agencies, so it would be equally problematic whether classified information was carried over the government system or a private server, experts say. In fact, the State Department's unclassified email system has been penetrated by hackers believed linked to Russian intelligence. Many of the emails to Clinton came from state.gov email accounts, noted Steven Aftergood, an expert on classification at the Federation of American Scientists. "So if there is routine security screening and monitoring of incoming and outgoing State Department emails, anything that is classified should have been flagged. That does not seem to have happened. I think it's the State Department culture." "In real life, the 'everybody does it defense' doesn't fly," Moss said. In a statement, State Department spokesman Alec Gerlach said it's not uncommon—across each agency—that when considering information for release, "certain information must later be upgraded even if it had not previously been classified." "Classifying information ahead of a release doesn't necessarily mean information was mishandled, but it certainly does reflect the seriousness with which we take our obligations and the fact that over time, some of the circumstances in which information is being digested can and do change," Gerlach said. 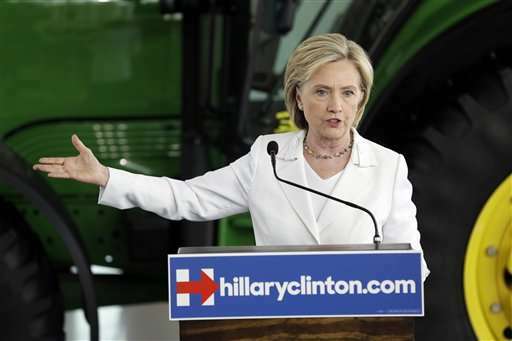 Clinton, speaking to reporters after an event in Iowa, said: "My use of personal email was allowed by the State Department. It clearly wasn't the best choice. I should have used two emails, one personal, one for work. And I take responsibility for that decision." She added, "I'm confident that this process will prove that I never sent nor received any email that was marked classified." The AP has asked the State Department to turn over records reflecting any concerns by agency computer staff or security officials over Clinton's use of a private email server, but has received no responsive documents. Clinton also had access to a classified messaging system, but it's not widely used at the State Department. Most department officials in Washington and at embassies have on their desktops a classified network that goes up to "secret" level. A small number of State officials, including the secretary, can use a third system that goes up to "top secret" level in special secure rooms. But even the middle-tier "secret" network is cumbersome for many in the agency, said officials who would not be quoted when discussing internal security policies. Only a few top officials in Washington are able to read classified emails outside the department's headquarters. Most ambassadors can't open their accounts from home. Officials in the field may have no access at all. Lots of State Department information is meant for use, sharing and interaction with foreign officials, the vast majority of whom aren't authorized to receive classified U.S. material. State Dept: Most official email not auto-archived until Feb.